I don’t do it often but occasionally if we are blessed with a warm day then making a main course salad for dinner is perfect. This is another one of those favourite things I don’t make very often. 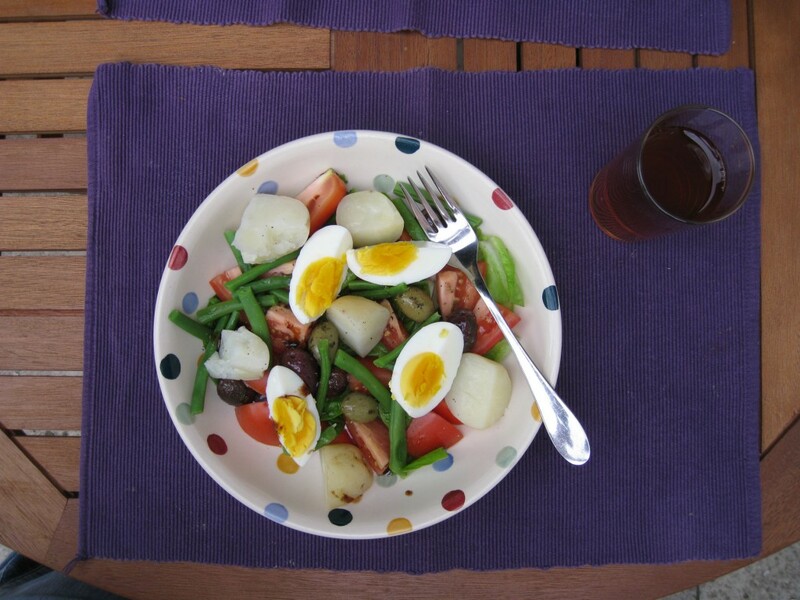 Salad Nicoise. Al la vegetarian, meaning no tuna. I’ve never had one with tuna in it but I’m sure ours is just as good. Home grown beans and potatoes and salad leaves make it all the more wonderful and being able to eat outside was the icing on the cake. I don’t know how chef’s come up with combinations of food. Maybe it’s accidental or experimental. What I do know is that the combination of olives, tomatoes, green beans and hard boiled egg is sublime. Or potato, egg, green beans and tomato. Every mouthful is a delight to the taste buds. I know it doesn’t look too good in this picture but this is my twist on a casserole recipe I ripped out an a Good Food magazine years ago. It’s an absolute favourite of mine. The main twist in my version is the ommission of the chicken and the substition of vegetarian sausages. I love veggie sausages in tomato-y sauces. I used to buy the magazine and I tore out recipes I liked and made a little pile of them. 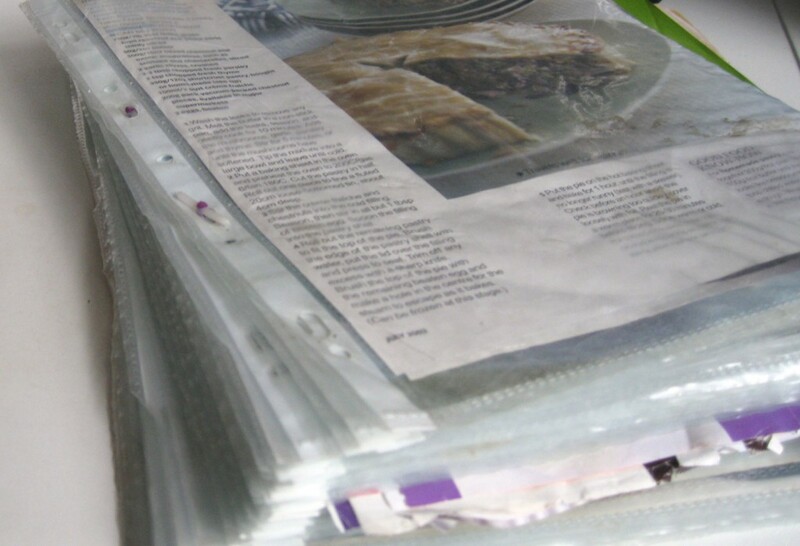 When the pile grew I gathered some clear plastic covers and hey presto a cookery book of favourites was born. This is my go to recipe book. Good Food recipes are great. Easy, quick and don’t use every pan in the cupboard! 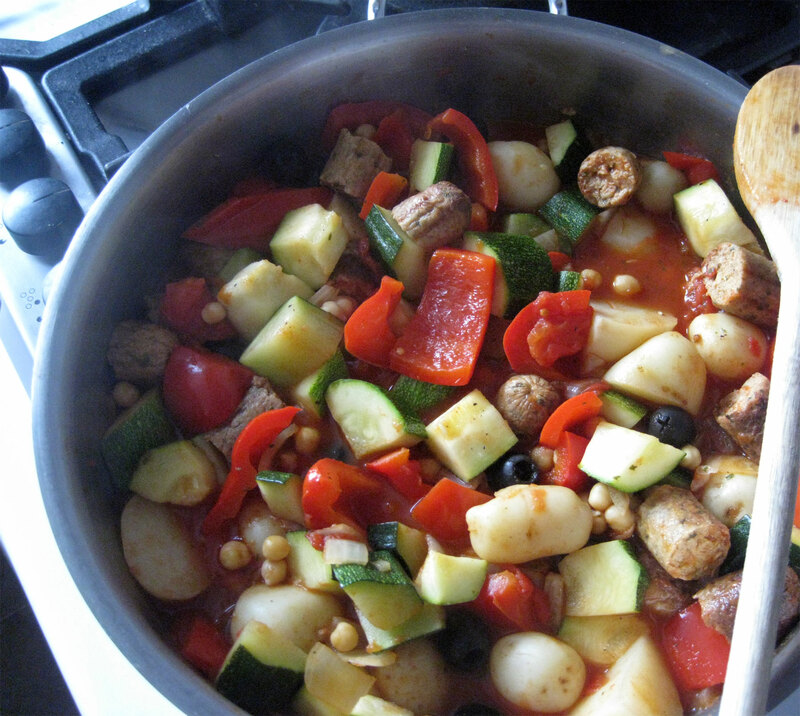 So tonight, as I we have a glut of courgettes, I went for the potato, chick pea and sausage casserole. It has so many of our loved foods and olives too. And then I was thinking why I only make this casserole when we have a glut of courgettes? I guess I ‘save’ it for once in a while dinners rather than every week. That way it’s always a treat. 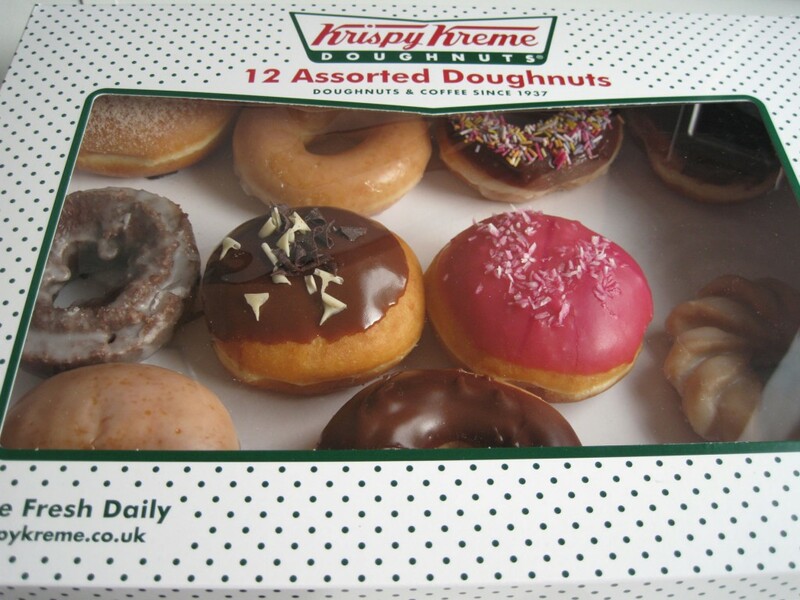 My older niece announced, when I arrange to meet up with her recently, that Krispy Kremes had made it all the way up North to Leeds and that we needed to go and sample said doughnuts. Fine by me. I like a doughnut. So we arrived at the new shop just off junction 27 of the M621 at 2pm on an overcast Friday and found a proverbial madhouse. The staff of the shop were actually directing traffic in the car park! It was that busy. 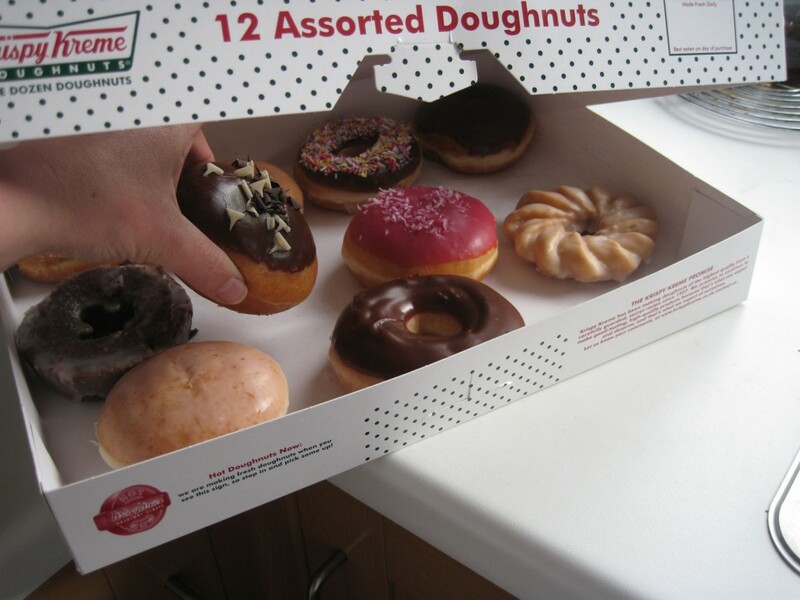 After parking the car in next door Pizza Hut’s car park we joined the queue which was all the way to the door but decided that really if you were going to sample their wears then you needed to buy a box full of doughnuts and that also meant not queing at all. Result. We handed over the cash over and left the queue behind us clutching our booty. Hoorah. So, what did I think? Were they the ulitmate? They were nice. Not delicious although I’ll need to try the other flavours, of course, just to be certain they are not the ultimate but yes they were good stuff. I have to say that nothing beats freshly cooked ones on the sea front at Filey (or any seaside I’m sure), but boy that chocolate topping is scrummy. What’s that? Award winning gardens in Leeds. Absolutely. Gav and Bud and I visited the Alhambra, Monet and the two Chelsea winning gardens recently built in a spot opposite the park and Canal Gardens. Signposted ‘Specialist Gardens’. 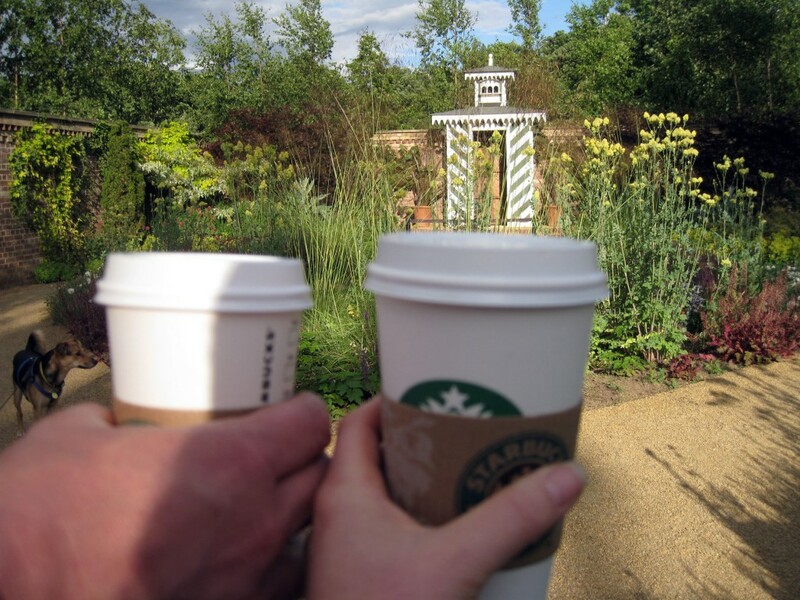 And we enjoyed a coffee while we wandered. Perfect summer evenings walk. Right on our doorstep too. Well that’s that then. The end of an era. I was a reluctant and late fan of Harry’s. I remember wondering what all the fuss was about and being envious that someone could write something that sold so many copies and made that many fans. Eventually I caved and listened to the books on tape and then watched the films. And was hooked. I love a good v’s evil story as long as good wins the day, of course. 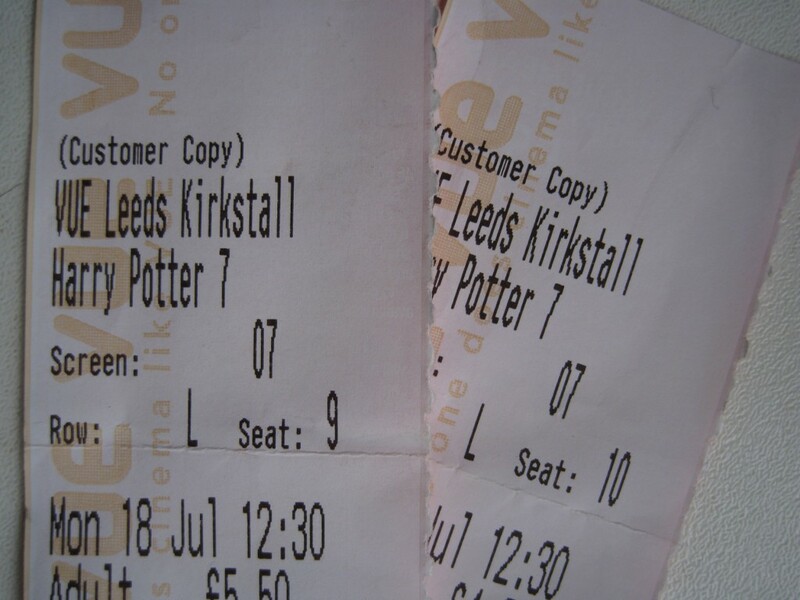 So on Monday I took my Mum and went to see the last instalment. 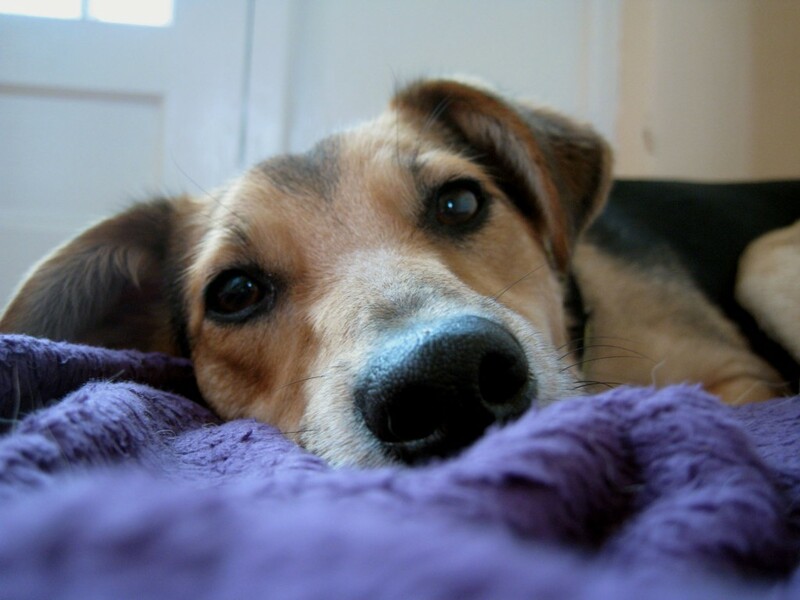 I cried – quite a lot but then I am a total softie. I enjoyed it, even if it was a tad tooooooooo long, but that’s what I think about most films these days. They could have spent a bit more time with that poor old dragon and the school scenes were short as well but that happens in translation I guess. Anyway, go Harry you now grown up fella. Live happily ever after. If you guessed the 140th Open at Royal St Georges you would have been correct. It is fair to say that we like our live sporting events. 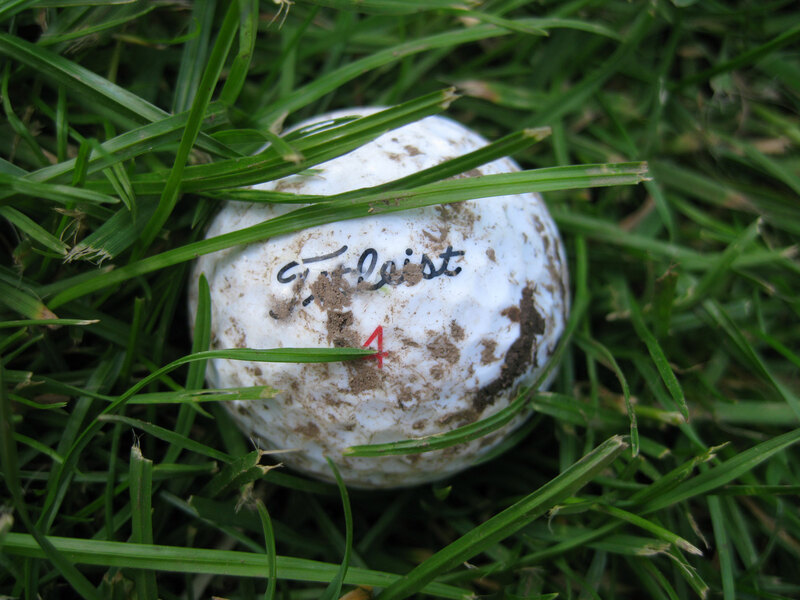 Golf, the watching not playing, has been part of my life as long as I remember. My Dad loved to watch on the TV and he did play for a few years with my then Brother in law. Gav and I went to our first Open in 2008 at Royal Birkdale and loved every second. We trekked up to Turnberry the following year and again loved it. And even though it meant lumbering my Mum and sister with the Budster for three days that didn’t stop us from going south this year to watch Fridays 2nd round. Fortunately we missed the bad weather and were complaining that it was too hot. Another day to remember though and we are watching the final round planning next year. We must watch more that one round next time. It is widely acknowledged within my family and friends that I’m a bit odd. I have very weird ideas about stuff. Stuff like how to be green, how to minimise my carbon foot print and do the right thing. The problem is doing the right thing is a tricky business not just because it’s a minefield of decisions to make but also just following through on your principles. a) Not buy any because the are not in season. b) Only buy organic – whether from UK or abroad. c) Only buy fairtrade – whether from UK or abroad. d) Only buy British organic. But if you buy British have they been cold stored therefore using power to keep them from going off? See, what a minefield the purchasing of a fairly staple item like an apple can bring? 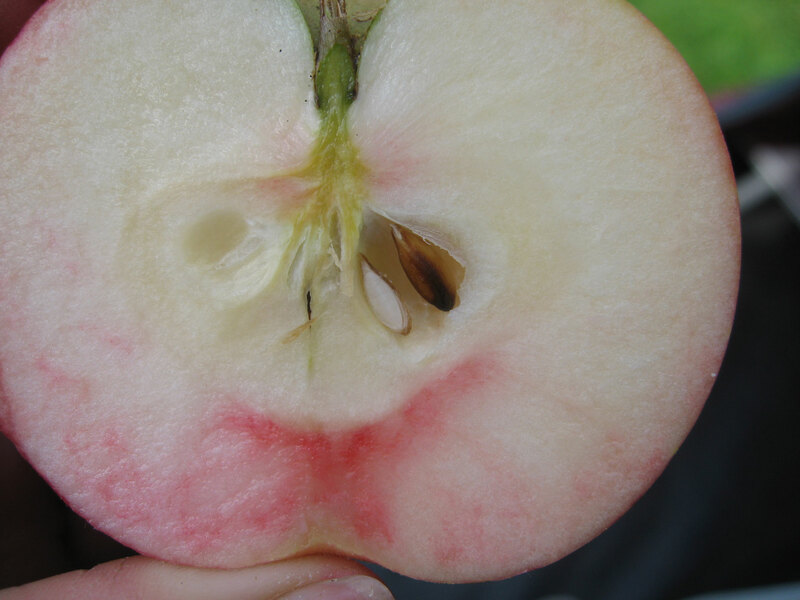 We do have our own apples so at least for a couple of months I know my conscience is really clear. And waiting for them to ripen up is part of the fun of having a fruit tree. I also have another option apart from growing our own and that’s Riverford. (or Riverford on Home Farm up North) I can’t recommend them, highly enough. I have too many of these principles – vegetarian, organic, fairtrade, no palm oil in biscuits, no leather shoes, not air freighted flowers. I’ve stopped buying flowers for the house because most are air freighted and you never know if the workers are paid fairly (this goes for anything you buy of course) And then I understand that lots of flowers are grown in hot houses anyway, even ones grown in this country. Like I say, minefields. Here’s another example. Since last Christmas I’ve been searching for furniture for the living room. I want pale wood, a coffee table, tv unit and a book case. I want the wood to be sustainably sourced and FSC if possible. And it took 5 months of searching the internet to find anything that I liked and ticked most of the boxes. And in the end I’m having two of the pieces made specially anyway. However, we have made in roads (no pun intended!) on the greener front when we recently went from two cars to one car and that car just happens to be a Toyota Auris hybrid. Go us. Or rather go Gav because it was all his idea. 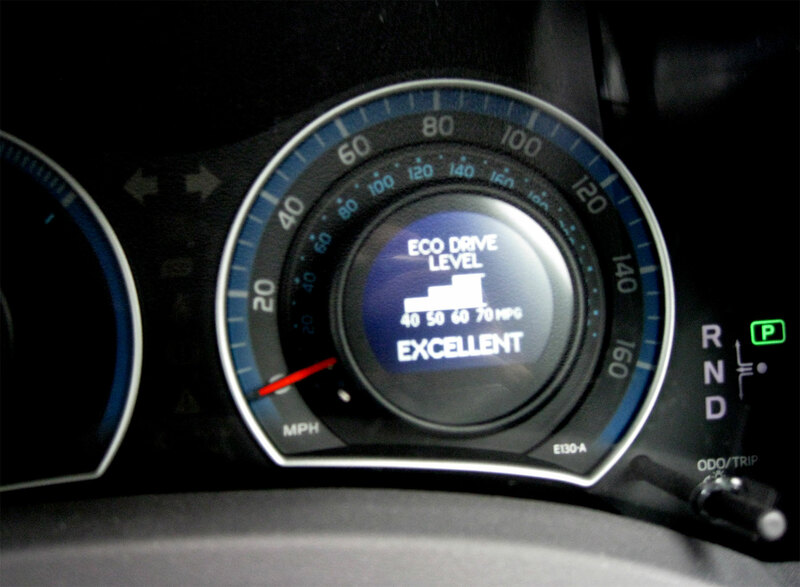 Learning to drive it is a challenge but when you get to your destination and the little readout on the dashboard flashes excellent at you and declares that you got 65 miles per gallon during the trip you do feel rather smug. I know most of my attempts to do the right thing end up not quite working out and I know I drive Gav mad with my constant mutterings about doing this instead of that because it might be greener. I don’t have all the answers but I’ll keep trying in my inimitable way. Okay so this isn’t my normal genre of novel. Science Fiction. I like sci-fi films but can’t remember reading science fiction before. If you remember I was reading this along with Gav to see if we could work the plot out together. It was a struggle to start with. Getting my head around all the flipping and flopping between simstim and the matrix etc. I had to re-read quite a few pages then I decided to go with it and if I didn’t quite get it, so be it. I liked some of the characters, even if they were anti-heroes and anti-heroines and the writing was amazing. The author painted incredible pictures of this bizarre futuristic world. But it was definitely odd. Passing over that though I’m glad Gav got me to read it even if it took us six weeks and ate seriously into my quest to read 26 books in a year. 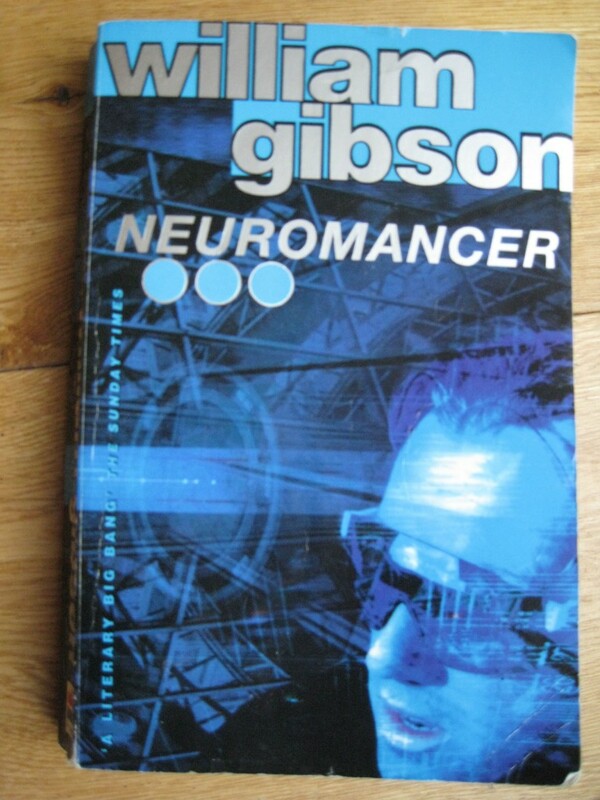 Apparently this novel spawned the phrase ‘cyberspace’ and as I mentioned above William Gibson writes about the ‘Matrix’ not exactly like the film of that name but pretty close. I think it is undeniable that the Wachowski brothers took influences from Neuromancer for the Matrix trilogy. And also both Gav and I felt that a scene towards the end of the book where Case, our antihero, is trapped on a beach was exactly like a scene from Inception. And rather than feeling cheated by filmmakers taking influence from novels I like it. It’s not pure plagiarism is it? No definitely not it shows that some things influence other things and after all there are only so many stories to tell. In conclusion I’m glad I read it. It kept me intrigued even if basically it was set in a seedy futuristic underworld for the most part and was full of unnecessary murders all for the sake of the ……. Well I don’t want to spoil the end for you, do I? Buy bread when you can bake it. Or have a bread maker bake it for you. 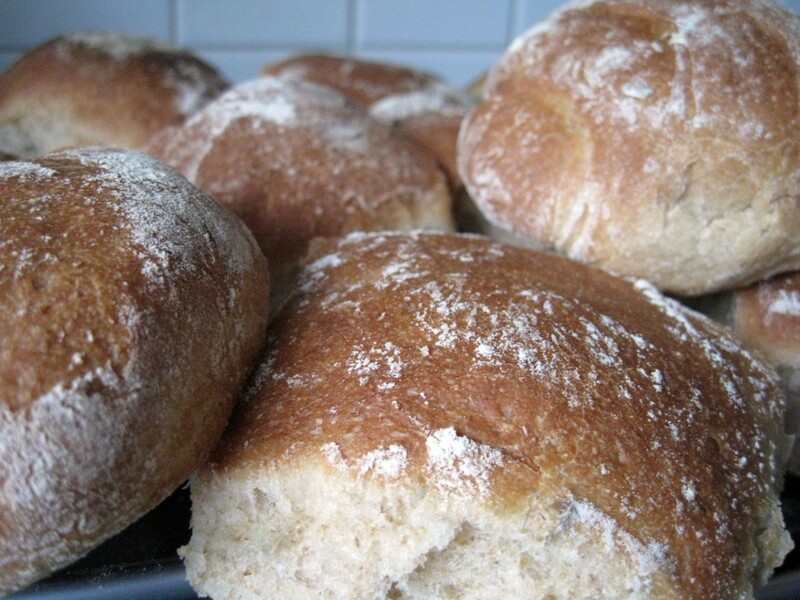 When Gav bought the bread maker 5 years ago I resisted the idea of making our own bread. Even though you only fling the ingredients into the breadpan and switch the machine on it still seemed like hard work to me. Over the time we’ve owned the machine we have made lots of loaves and rolls but also, just as often, gone out to buy some. But these days I’m a convert. I’m not sure if in the long run, taking into account the initial cost of the machine the ingredients and the electricity we use to bake the loaves, whether it is cheaper to do it yourself but I’m not so bothered about that. I almost always use organic flour and there are only four other ingredients so I know what’s in my own rolls and why would I want to miss out on that delicious smell of freshly baked bread. It makes me feel like a real homemaker and it’s so much better for us and those two things combined mean baking your own wins hands down.